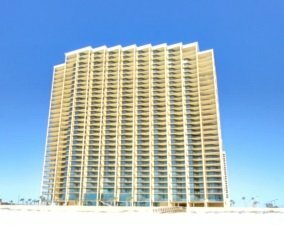 Orange Beach condo for rent at Phoenix West II with 2 master suites, both w/king-beds and a 3rd bedroom with two queen beds. All bedrooms have flat screen HDTV's, The living room features a 60" HDTV with a DVD player. The LR sofa converts a queen-sleeper for additional sleeping accommodation. The dining room seats 8, with additional seating for four at the bar. The kitchen is completely stocked with all the cookware and appliances needed to prepare elegant meals for those inclined to do so - next to the kitchen is a wet bar with an ice maker - this vacation rental home is top of the line in amenities and situated the perfect location. Community amenities include pools, BBQ grills, a lazy river, modern workout facility and much more.